Whole wheat bread is supposed to be tough, grainy, and perhaps a little dry. Kids turn their noses up at the thought of whole wheat and reach for the white. It’s an acquired taste that you get used to when trying to eat a healthy diet with more whole grains. Bread is normally full of carbohydrates and usually a bit skimpy on protein. And the good stuff made with only whole ingredients costs upwards of $5 a loaf in the store. 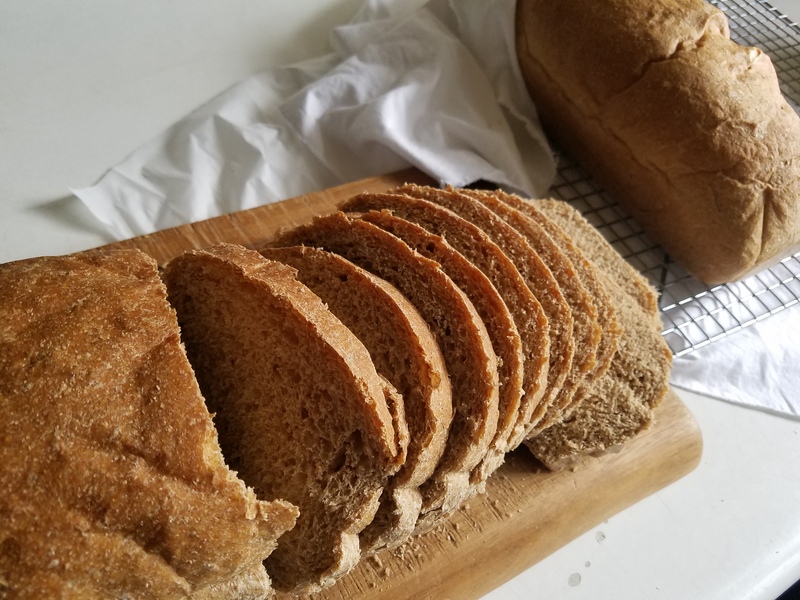 So what if I told you I created a recipe for whole wheat bread that is not only healthy, but soft, delicious, full of protein and about $1 a loaf to make? The secret is vital wheat gluten. Now before you crinkle your eyebrows at what has become almost an evil word these days, remember that gluten is the protein that makes stretchy wheat bread possible. 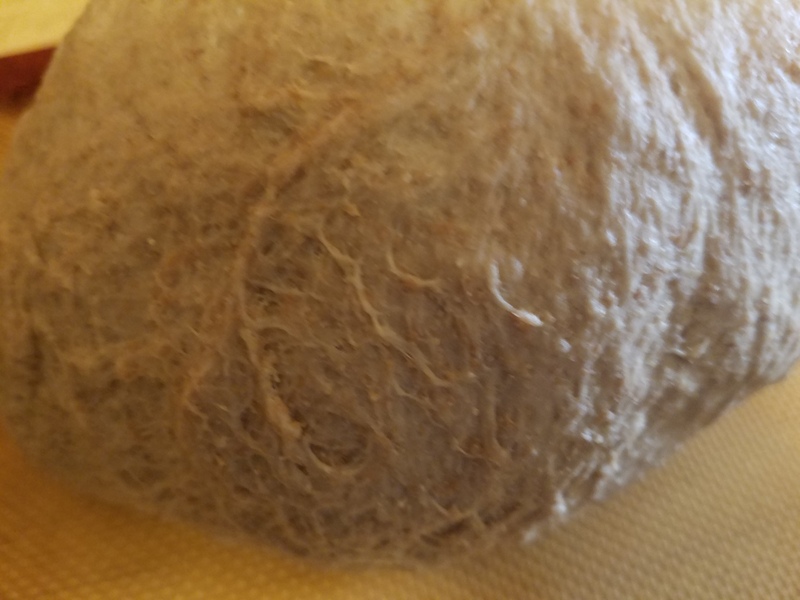 It traps the air inside the loaf creating the webbing of air pockets that is essential to the delicious texture of bread. If you are lucky enough to be gluten tolerant (the vast majority of us are), then it can become an important part of a healthy diet, especially for vegans. The reason that white bread is so soft is because the bran from the wheat has been stripped away, leaving more gluten in the flour per cup. If you try to make a loaf of whole wheat bread without adding vital wheat gluten, it will be dense and heavy simply because by volume there is a lot less protein creating the air pockets. 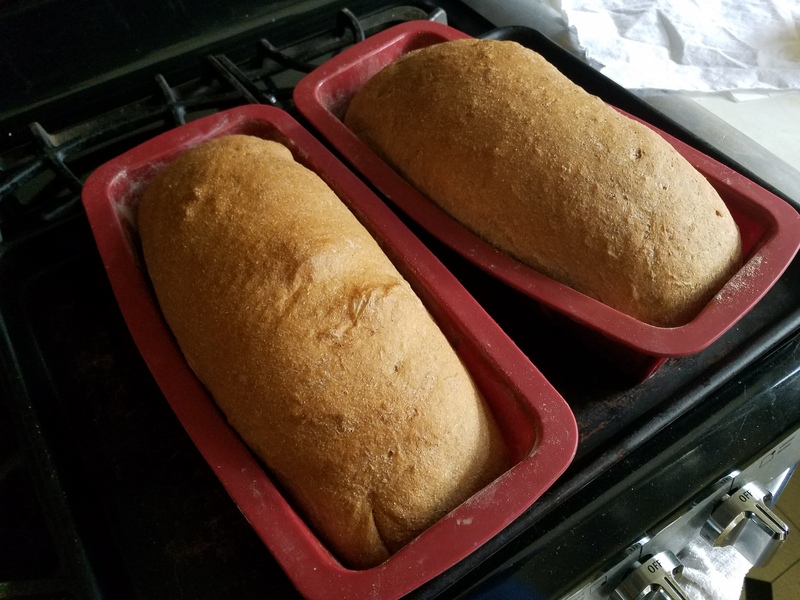 By replacing about a quarter of the whole wheat flour in my normal recipe with VWG, I created billowy loaves that have more than 10 grams of protein in each 129 calorie serving! Just amazing. I like to use long, skinny silicone loaf pans to get small sandwich slices. I get about 20 slices per loaf and each serving is two slices. My favorite method of baking bread is to create a sponge. This simply means a wet flour mix with yeast and/or sourdough that is allowed to develop before adding the rest of the dry ingredients. You mix up the sponge, let it sit for an hour (or overnight with all sourdough) then work in the second half of the flour and the salt. I prefer this method because there is no double-rising of the dough and it seems to take less time. 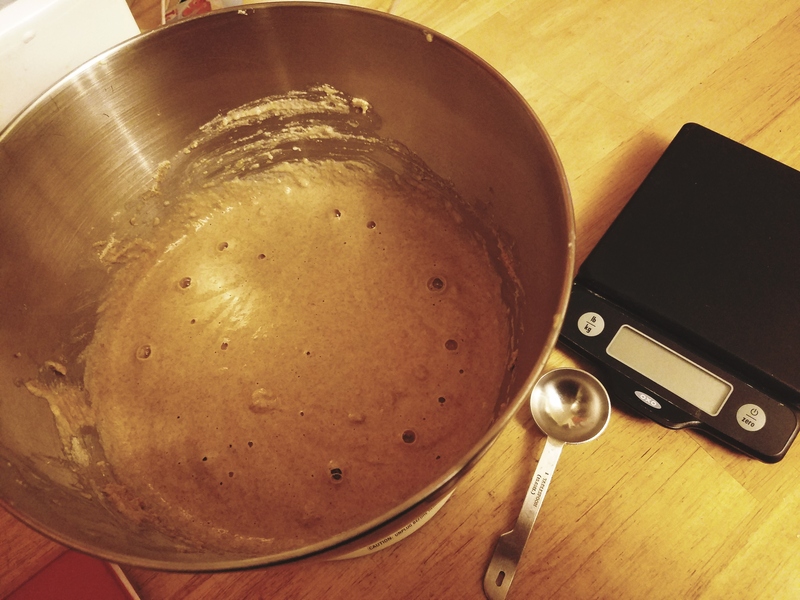 I prefer to weigh my ingredients in grams so that I can get exact measurements each time. Once you get used to weighing, you’ll never go back to using volume again. This has become my absolute favorite loaf of bread. I typically sneak a little sourdough starter in with the sponge to get all that fermented goodness, but I still rely on some yeast because I get impatient. The recipe below skips the sourdough. Soft, billowy, high protein whole wheat sandwich bread. For the sponge, mix all of the sponge ingredients in the bowl of an electric mixer on medium until well mixed, about five minutes. Remove whisk attachment, cover bowl, and let rest for an hour until very bubbly. Add the dough ingredients and with the dough hook attachment, mix at low speed until no dry flour remains. Mix on medium speed for about ten minutes until dough is smooth. Divide into to equal halves and shape into rounds. Cover with parchment paper and let rest 15 minutes. Shape into logs and place into floured bread pans. Let rise covered with parchment and a towel in a warm place 60-90 minutes or until risen over the sides of the pans. Let rest in pans for 10 minutes before removing them. I just stumbled upon this blog searching for recipes. Where is the wheat gluten in the recipe? Thank you for catching that! It's the most important ingredient! I have edited it. It's 1.5 cups added to the dough. Hi, for your nutrition info, how many slices per loaf is that based on? The recipe makes 2 loaves, 20 slices per loaf. Do you think I would be successful doing it by hand? Hi Henry! The vital wheat gluten makes the dough stiffer and very elastic, so it will be quite a workout to do it by hand. But it can be done! Let me know if you try it! I use silicone pans and I flour them. With metal pans, yes, grease and flour.